React is a user interface framework developed by Facebook. It has a quickly growing developer adoption rate and was ranked as the most loved language or technology in the 2017 Stackoverflow developer survey. 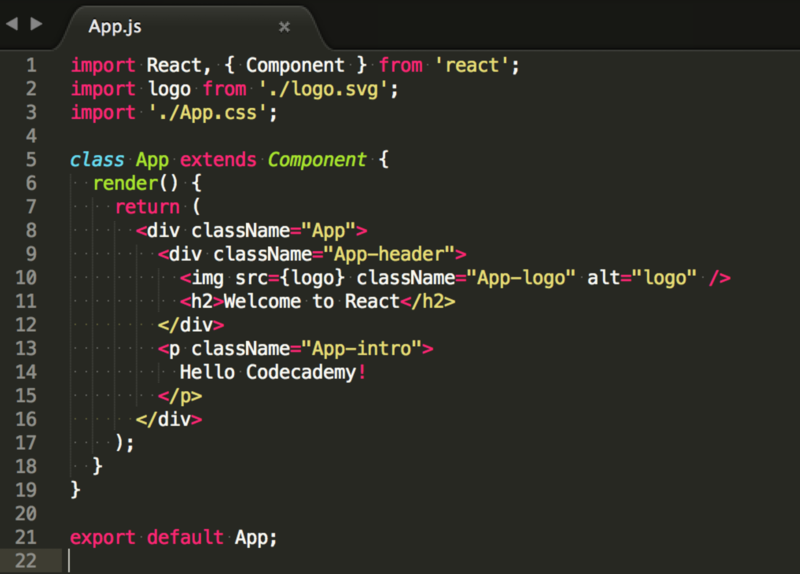 This article will walk you through setting up your first React app and assumes you are familiar with text editors and command line navigation. 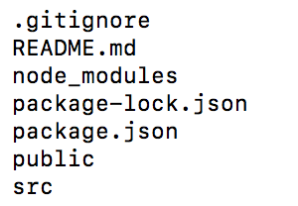 We will be using the Node package manager (npm), so you will need to have Node installed. It is possible to manually create a React app, but Facebook has created a node module create-react-app to generate a boilerplate version of a React application. Besides providing something that works out-of-the-box, this has the added benefit of providing a consistent structure for React apps that you will recognize as you move between React projects. It also provides an out-of-the-box build script and development server. We will use npm to install the create-react-app command line interface (CLI) globally (-g). Now that you have the CLI available for use, navigate to the parent directory that you would like to place the application within. Then, run create-react-app with the name you would like to use for your project (just no capital letters :-) ). Before we run the app, lets take a look around the app structure and see what it contains. create-react-app has taken care of setting up the main structure of the application as well as a couple of developer settings. Most of what you see will not be visible to the visitor of your web app. React uses a tool called webpack which transforms the directories and files here into static assets. Visitors to your site are served those static assets. 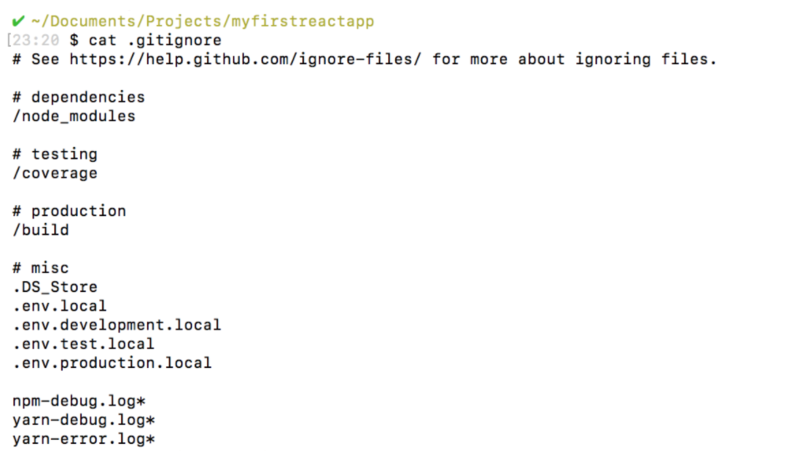 This file outlines all the settings for the React app. "private": true is a failsafe setting to avoid accidentally publishing your app as a public package within the npm ecosystem. devDependencies contains useful node modules and versions for using the React app in a development environment. Here, it contains one dependency, react-scripts, which provides a set of useful development scripts for working with React. scripts specifies aliases that you can use to access some of the react-scripts commands in a more efficient manner. 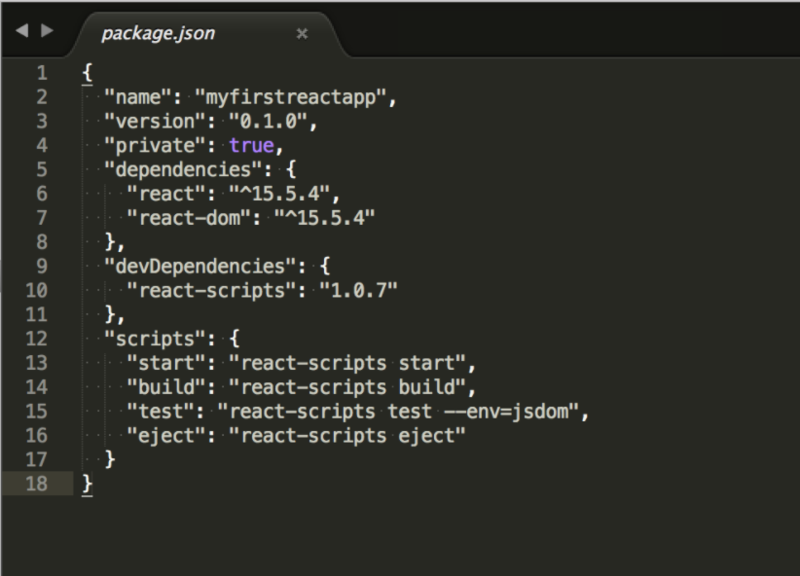 For example running npm test in your command line will run react-scripts test --env=jsdom behind the scenes. This directory contains dependencies and sub-dependencies of packages used by the current React app, as specified by package.json. If you take a look, you may be surprised by how many there are. Running ls -1 | wc -l within the node_modules/ directory will yield more than 800 subfolders. This folder is automatically added to the .gitignore for good reason! Don’t worry, even with all these dependencies, the basic app will only be around 50 KB after being minified and compressed for production. This file contains the exact dependency tree installed in node_modules/. This provides a way for teams working on private apps to ensure that they have the same version of dependencies and sub-dependencies. It also contains a history of changes to package.json, so you can quickly look back at dependency changes. This directory contains assets that will be served directly without additional processing by webpack. index.html provides the entry point for the web app. You will also see a favicon (header icon) and a manifest.json. The manifest file configures how your web app will behave if it is added to an Android user’s home screen (Android users can “shortcut” web apps and load them directly from the Android UI). You can read more about it here. As your React app grows, it is common to add a components/ directory to organize components and component-related files and a views directory to organize React views and view-related files. As stated, any changes to the source code will live-update here. Let’s see that in action. 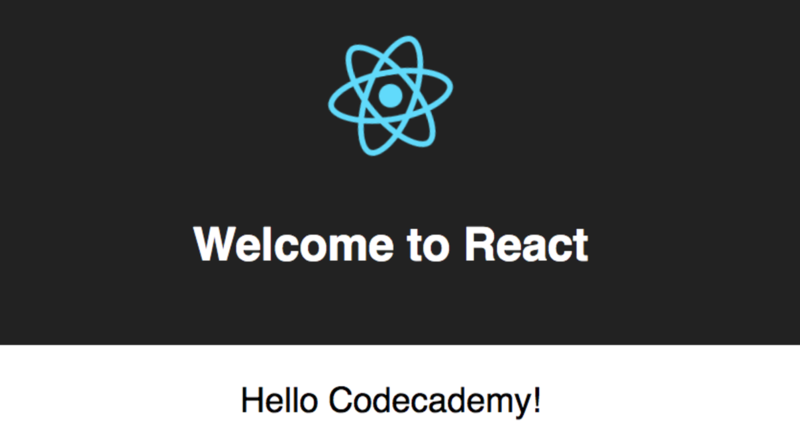 Change the main paragraph text to read: Hello Codecademy! in App.js and save the file. Congratulations! You’re now up and running with React. You can clean up any unnecessary files and begin adding functionality for your application.